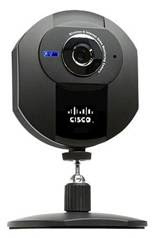 I recently found the Cisco WVC80N for sale at Best Buy. I was visiting my relatives in the Midwest and hoping to buy a camera that I could configure for them with sensr.net. To use network cameras with Sensr, you need one that supports FTP. I was disappointed to find that FTP was not listed on the side of the box. Since this was the only network camera they had, and the store was closing in 10 minutes, I did a quick search from my iPhone and found this FAQ, indicating that indeed the camera will support FTP. I went ahead and bought the camera. It was a bit pricey at $150 but I figured that if it didn't work, I could return it the next day. Best Buy has a pretty decent return policy. In this case that worked in their favor, as I'm sure it does many times. As with many of these network cameras, the setup software only works on Windows. If you have a Mac or Linux, you'll have to forgo the software install, which in my opinion is probably a good thing. There is no reason you should need to install software on your PC to setup or use a network camera. So a couple of things I learned. First, by default, the camera will grab an IP address over the ethernet using DHCP. This is pretty standard. The trick with these cameras is to find the IP address that your router gives out. The above mentioned FAQ also says the default IP is 192.168.1.100. This is NOT the case if your network has DHCP, which is probably the case. I found the IP address by looking at the clients table on the home network's router. The second thing I learned was that the camera doesn't support timed FTP. This means you can't simply have the camera FTP images every second, which is the way I like to setup cameras on sensr.net. As a work around, I turned on Motion Detection for the camera and told it to FTP the images to sensr.net. I then set the motion detection level as sensitive as possible. Unfortunately to set the overall sensitivity, you need to use Internet Explorer, since that configuration is set using an Active X control. Yuck! The advantage of having Sensr, rather than the camera, do the motion detection, is that the live views are much more interesting. If your camera only sends images to Sensr when there is motion, the Live Preview links from the sensr.net site won't be very interesting. You would be better off buying the Dlink DCS-920 which works well with Sensr and is considerably cheaper.